This is a bee quilt with blocks made by members of the Siblings Together group and a few other kind donations. 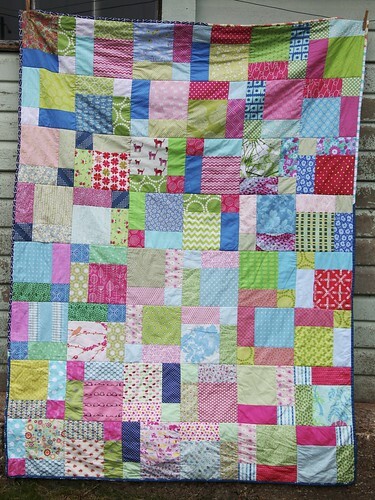 It is actually the second quilt made with the blocks I received, here is the first, it looks quite similar. 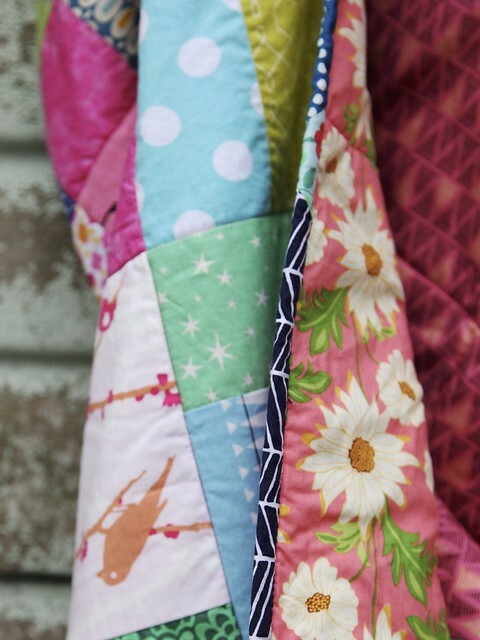 I try to choose a block that is large and fairly simple so that it doesn’t take long to put together and also so that I have enough blocks for a whole quilt top if members just make one block each. The disappearing nine patch was made with 7″ squares. I had one spare block and added this to the back along with some other donated pieces that folks sent with their blocks. 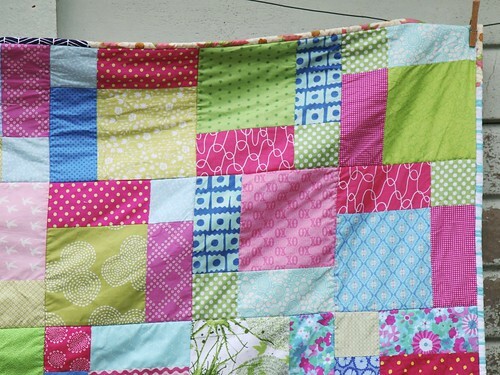 I do love how blocks from 14 or so different people can work together to make a bright and colourful quilt. This is the first feminine bee quilt I have made and it’s been a really nice change from making ones that I think a teenage boy would like (I would be delighted though if a teenage boy picked one of these quilts as his favourite). This was my goal for October and on my 4th quarter FAL list, so I am really pleased to have it finished and have already sent it off to the Siblings Together charity. I’m entering this into the Large Quilts category and looking forward to browsing lots of other quilts in all the categories! I like the distribution of color. 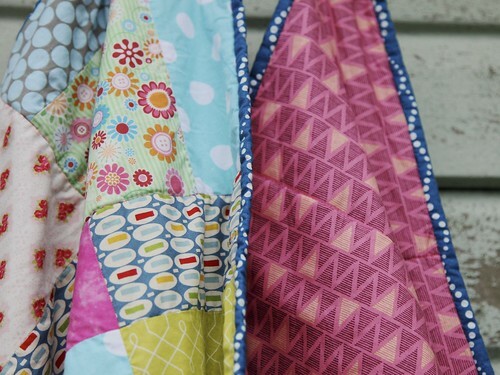 This is a bright and happy quilt. 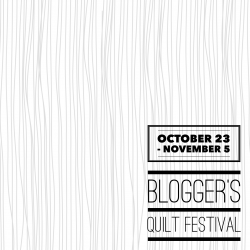 Good luck with the Bloggers Quilt Festival, and congratulations on meeting your October goal. 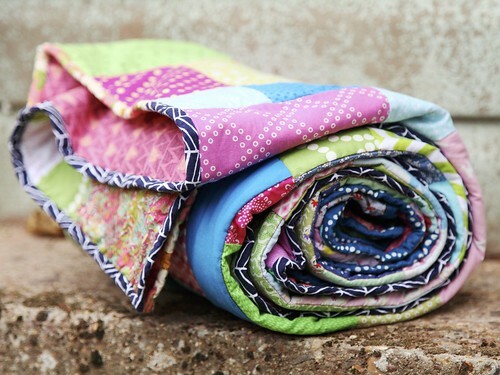 There is just something special about many hands (and hearts) making a quilt for someone they don’t know. 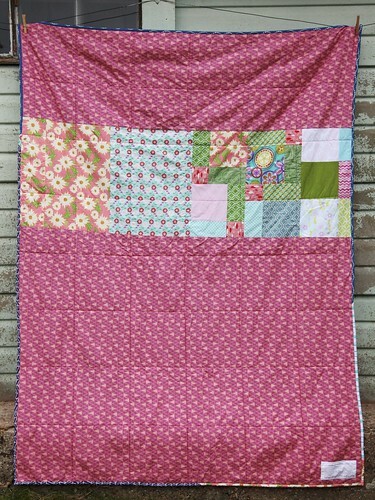 Lovely quilt that will be loved very much by the little girl who receives it. So glad you linked up with ALYOF so I could enjoy the eye candy! This is a lovely quilt, congratulations on completing your October project for ALYoF. Bravo – you have really made a fabulous contribution thank you Mary! 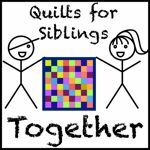 And thanks for joining the #siblingstogether link up!